The peripheral giant cell granuloma has an unknown etiology, with some dispute as to whether this lesion represents a reactive or neoplastic process. However, most authorities believe peripheral giant cell granuloma is a reactive lesion. 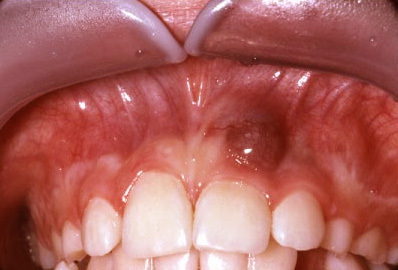 appear frequently on gingiva and they also begin with the letter “p”: pyogenic granuloma and peripheral ossifying fibroma. Because of its similar microscopic appearance to the bony lesions called central giant-cell granulomas, peripheral giant-cell granulomas are considered by some researchers to be a soft tissue equivalent. epulis, this lesion was first reported as fungus flesh in 1848. Almost half of all cases have lesional cells containing surface receptors for estrogen and this has led to speculation that some peripheral giant cell granulomas are responsive to hormonal influences. often found in the mandible rather than the maxilla but can be found in either anterior or posterior areas. The underlying alveolar bone can be destroyed, leaving a unique appearance referred to as “cupping resorption” or “saucerization”. Peripheral giant-cell granulomas appear microscopically as a large number of multinucleated giant cells, which can have up to dozens of nuclei. Mitotic activity is not unusual in the lesion and may even be pronounced in lesions developing in children and adolescents. Mitotic activity within the giant cells is, however, not seen and if present should be considered to be a sign of sarcomatous change. Additionally, there are mesenchymal cells that are ovoid and spindle-shaped. tissues. A thin band of routine fibrovascular tissue separates the lesion from the overlying epithelium, often with dilated veins and capillaries. In 50% of cases, ulcerations are present. 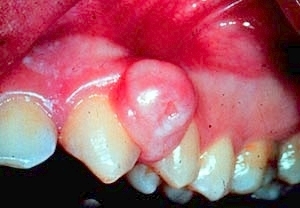 When surface ulceration is present, the ulcer bed consists of routine fibrinoid necrotic debris over granulation tissue. Admixed throughout the stroma are numerous osteoclast-like multinucleated giant cells containing varying numbers of pale vesicular nuclei similar to those within the surrounding stromal cells. These cells have eosinophilic cytoplasm, which electron microscopy has shown to contain large numbers of mitochondria.Immunohistochemistry has shown the giant cells to be only slightly different from true osteoclasts. The origin of the multinucleated cells is still unknown, but they are assumed to arise from syncytial fusion of mononuclear preosteoclasts of bone marrow origin. Peripheral giant cell granuloma can be differentiated from osteoblastic osteosarcoma by the uniformity of the stromal cells and by the lack of dysplasia in these cells. In young persons, however, numerous mitotic figures and active proliferation of stromal cells may make this distinction difficult. Peripheral giant cell granuloma may be indistinguishable from the rare extraosseous brown tumor of hyperparathyroidism. Treatment usually involves surgical removal of the lesion down to the bone. If there are any adjacent teeth, they are cleaned thoroughly to remove any possible source of irritation. Recurrence is around 10%. Very large or recurring lesions may represent brown tumors of hyperparathyroidism and will require treatment of the underlying endocrine dysfunction prior to surgical removal. This entry was posted in Gum Disease and tagged central giant cell granuloma, fungus flesh, giant cell epulis, giant cell reparative granuloma, myeloid epulis, osteoclast-like multinucleated giant cells, osteoclastoma, peripheral giant cell granuloma, peripheral ossifying granuloma, pyogenic granuloma on December 29, 2011 by chzechze.